You’ve heard of automatic bread makers, not it’s time for automatic roti makers. 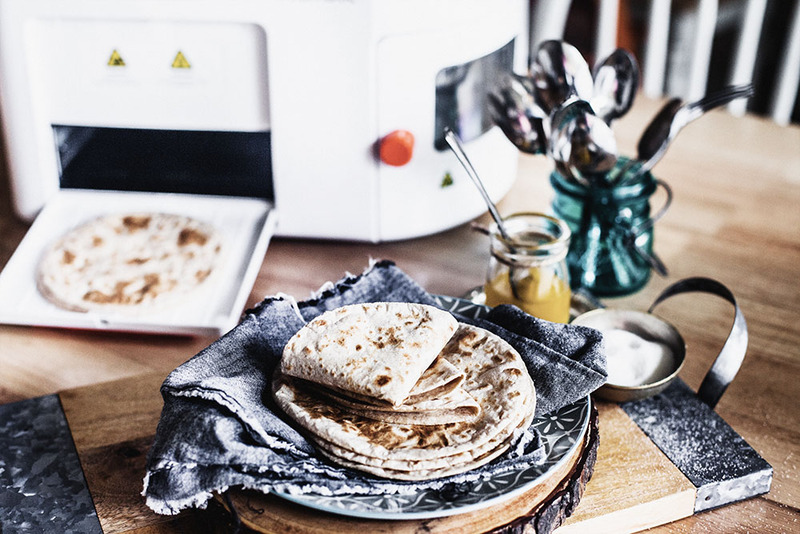 Created by Rishi Israni and Pranoti Nagarkar, the Rotimatic is transforming the way people cook and eat by giving families a way to make fresh, homemade roti, and other flatbread variations. These’s a lot to like about automated food production. Fill it up with flour, water and oil, turn it on and walk away. When you get back, you’ll have a stack of fresh roti, all consistent in shape and size. The roti themselves are decent – they have a crisp outer layer and doughy inner layer. It takes about two and a half minutes per roti; when fully loaded, it’ll make 20 roti in one batch. While it works its magic, it is very loud – like a vacuum running for 50 minutes to and hour. If you want more than 20 roti, you’ll have to refill the machine half way through. While having fresh roti everyday sounds awesome, there are some downsides to the Rotimatic. The machine is massive – 40cm x 40cm x 33cm – and heavy – around 45 lbs. This means if you have limited counter space, you may want to hold off on buying a Rotimatic until you have a bigger kitchen. The machine comes with a smart phone app. It’s helpful but has some functionality that could be improved upon (and will be, if the website’s “development in progress” statement is any indication). The price tag is also a bit hefty, though it is worth the investment for people (and time-crunched families) who love roti.